Last Saturday morning, my husband witnessed his son's newest AAC language innovation in action live and in person. It happened like this. Mu walked into the kitchen and seeing all the activity, hesitated. Me: "Hey Son! I thought I'd make pancakes and your Dad thought it would good if he helped. How do you feel about pancakes?" Mu swiped his iPad mini, gave it two quick taps, and we all heard: "It's all you can eat pancake time at IHOP!" Then he tapped the video to pause, smiled and wandered in to see the state of the pancakes on the griddle. His father tried to contain his emotions until Mu, satisfied that breakfast was going to be awesome, wandered back upstairs. "Oh my..." his father started when I cut him off "right?!?" I shouted in response. "Told you!" Me: Mu, let's get through your grooming this morning. Deodorant? Mu grabs iPad, swipes, swipes, taps twice: "Hello ladies, look at your man..."
Me: What do you want for lunch Mu? Mu grabs iPad mini, swipes, taps, taps: "Barilla presents, Spaghetti Marinara on the couch..."
Me: Son, your room is a mess! Mu looks up from iPad, swipes taps, taps: "I came in under the assumption that it was clean. I've been living in a fool's paradise!" Our arguments now include lines from whatever YouTube video he feels is appropriate. We had an entire verbal/gestural/YouTube discussion on his demand I prepare him pizza cake. He used this video to argue his case tap here. 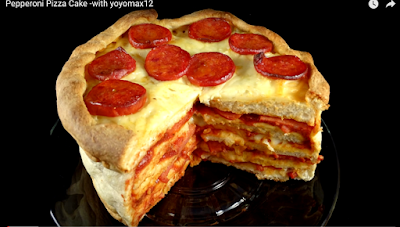 The infamous pizza cake, Yes the image is of 7 layers of pepperoni pizza in the shape of a cake. I don't know where or how to incorporate these scripts, but I began to write them down so he understands exactly what I mean when I speak to him by using the script he has for any topic I have heard him use a YouTube script for in the past. The thing about this entire process is that my son, who is medically considered too disabled to communicate beyond the level of a 6-month-old infant, has amassed this library of scripts from YouTube programs, music, commercials, and public service announcements in his own mind, and is now using them appropriately. We parents are being told so much what our autistic offspring can't do, what is and isn't a waste of time for them. If we express any dissent, we are quickly silenced with gaslighting expert answers for every sign that there might be more going on with our loved ones than most experts are able to access. All autistic teens are not the same. In fact, no autistic teen is like another. So it is tough for me to generalize and now say this will work for every nonspeaking autistic teen out there. But I do know that had I gone the usual route I would have browbeaten my son out of finding this new path to reach us by now. We aren't told to step back and observe loved ones we are told in the strongest terms to invasively work with them or what little function they have may never manifest. The process was miserable for him and for us. I learned my son was a master of YouTube speak when his father was on the way home one day. As always, when his father called the house I put the phone on speaker, and his father, after asking me if we needed anything he could pick up on his way home said, "Hello Mustafa. Can I take your order?" But this day, Mu suddenly tried to vocalize into the phone and when that failed, he tapped on his iPad and played a McDonald's commercial. When his Dad couldn't hear clearly and I said: "I guess Mu wants a hamburger or something from McDonald's?" Mu was so happy he hugged me. He went on to replay the ad until he was certain we understood what he wanted. He is self-generating conversation scripts. He is keeping a mental inventory of hundreds of videos to use for conversation when AAC isn't enough. He is doing all this independently. 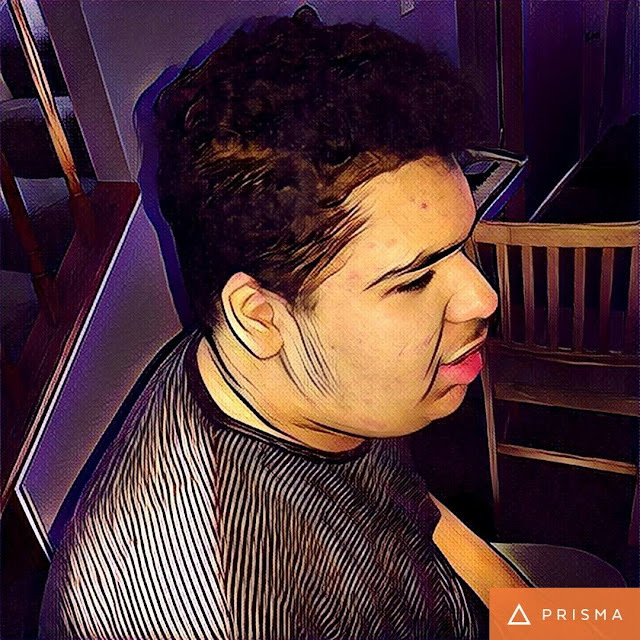 The diagnosed catastrophically intellectually disabled nonverbal autistic is using technology in his own unique way to communicate. When he thinks I'm in pain, Mu plays "It's Raining Tacos." It took me awhile to realize he was playing the song to ease my pain and not only because it made him happy. Our current running YouTube speak argument is centered around his insisting he's confident that I can produce a life-sized Darth Vader cake. After a firm no, he moved on to a variety of offerings from a particular episode of Outrageous Wedding Cakes. Hang in there, parents. Don't give up. Don't assume your offspring are simply vegetating. Everything, everything they are trying to do is an attempt to communicate with you. There is a great deal more going on than you have been told to by experts to believe.